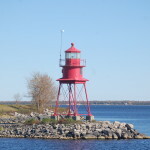 Alpena is well-known for its outdoor recreational opportunities on its beautiful Lake Huron shoreline, but the fun doesn’t stop there. 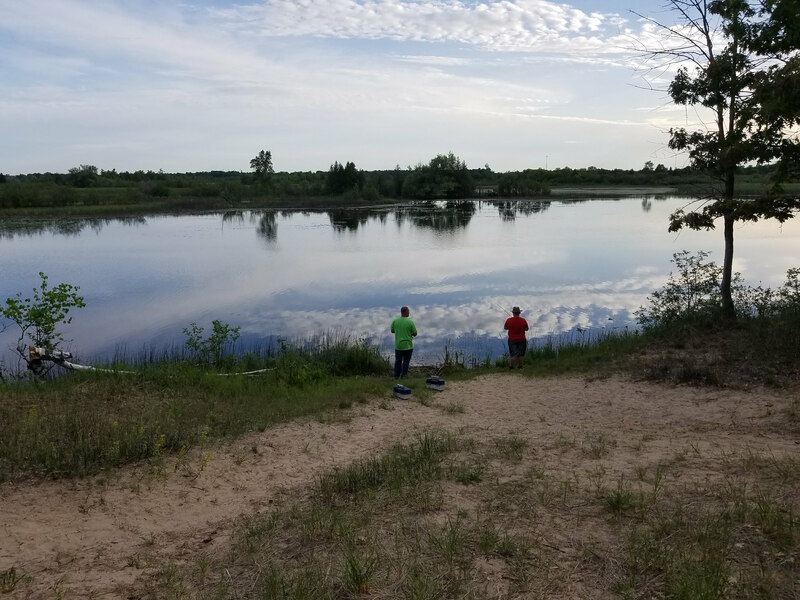 Island Park is a 17-acre gem just blocks away from downtown that offers hiking and running paths, fishing and kayaking opportunities, and wildlife viewing. 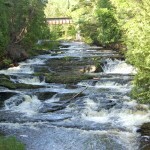 The Thunder Bay River flows around this island, forming the perfect habitat for a variety of birds, reptiles, amphibians, and small mammals. 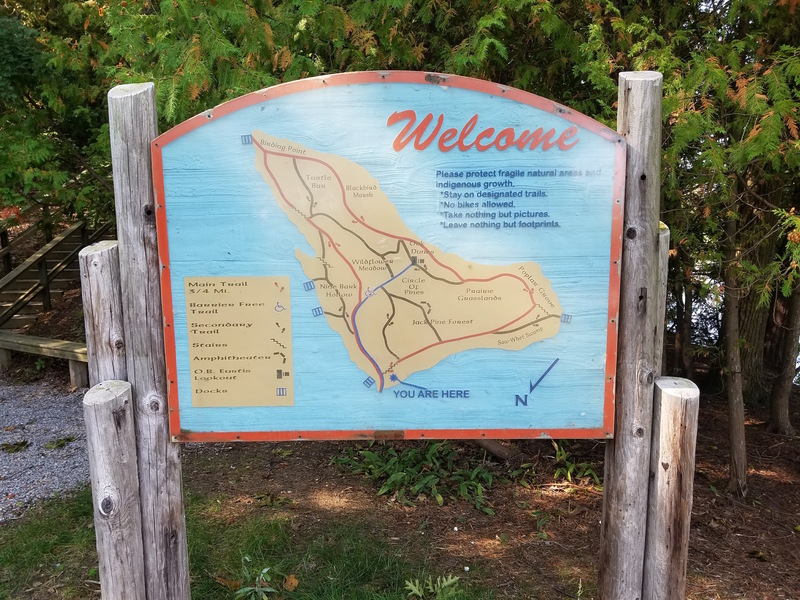 Ample parking and a kayak launch can be found at the adjacent 2.5-acre Duck Park, which is located on the west side of US-23 south of Long Rapids Road. 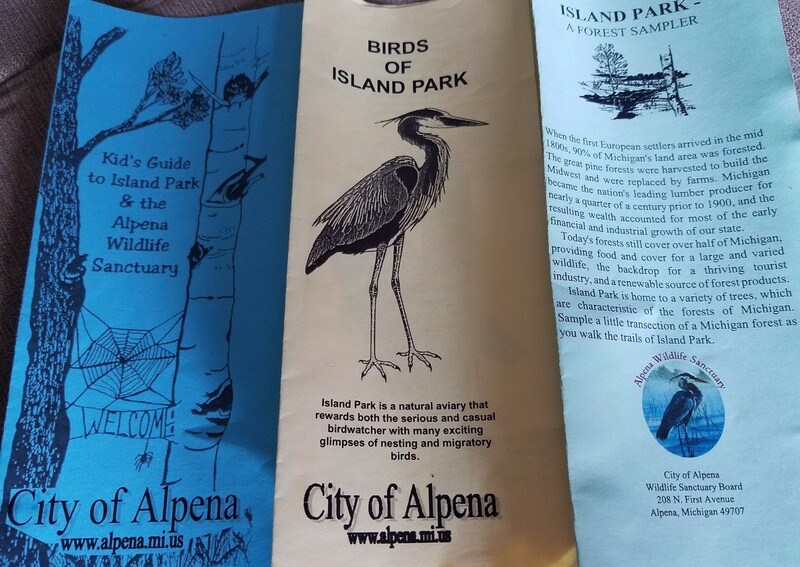 This park and the surrounding area are part of the Alpena Wildlife Sanctuary, so be respectful of the land by leaving no trace of your visit, cleaning up after pets, and not disturbing plants or wildlife. 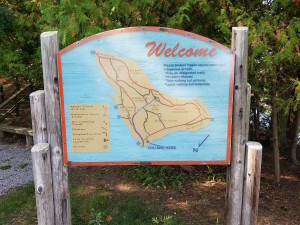 Once you cross the river on the covered wooden footbridge, you will reach a sign with a map of the island. 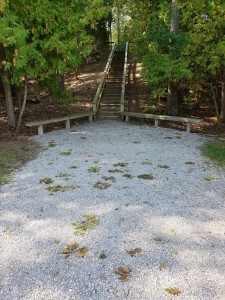 The suggested direction for the trail is to head straight and climb the stairs. 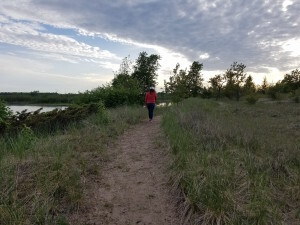 The “main trail” is only 3/4 mile long, but multiple side trails and spurs add distance while providing closer access to the river for fishing or other activities. The trail passes through sections like the Saw-Whet Swamp, Poplar Grove, Prairie Grasslands, Oak Dunes, Blackbird Marsh, Birding Point, and Wildlife Meadow. 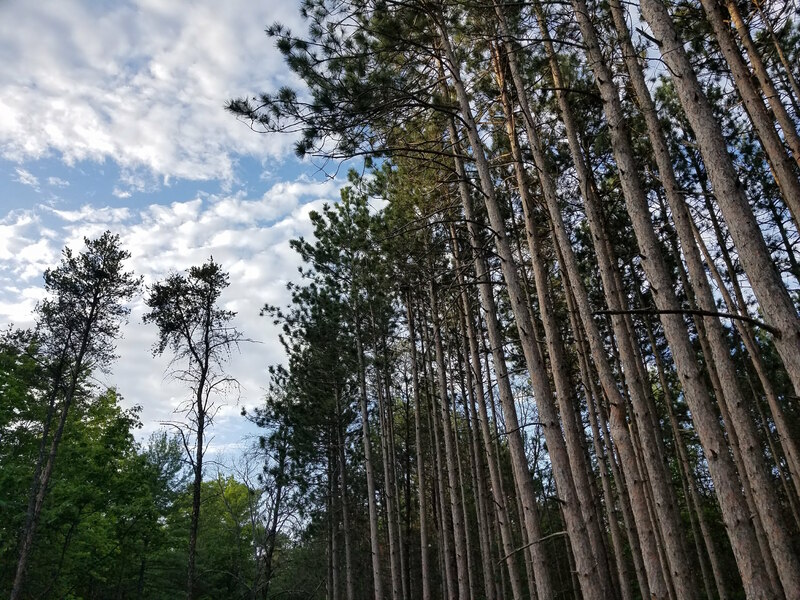 Side trails lead to Jack Pine Forest, Circle of Pines, Turtle Bar, and Nine Bark Hollow. There are multiple wooden docks for fishing that can be reached from these side trails. 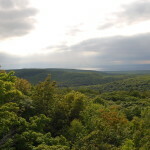 The trail is well-marked and well-worn, and with the exception of a few short uphill climbs will make for an easy stroll. If you head left on the paved path at the Island Park sign, a portion of the trail is handicap accessible. 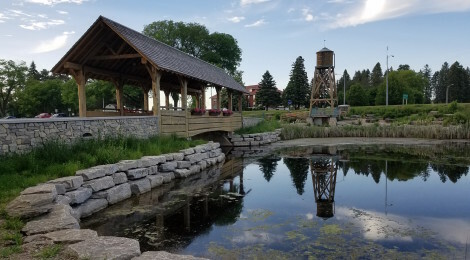 Island Park has more than enough to keep kids entertained for an hour or longer, and photographers will enjoy an endless amount of subject matter (at all times of day and in all seasons). One of the other draws for this excellent park is that it is never very busy. There’s plenty of room here, and while you may still hear some traffic noise from the nearby highway there is still serenity to be found at Island Park. 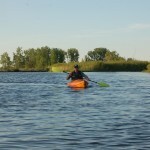 If you love hiking, nature, water, or wildlife watching this is the place for you in Alpena! A brochure stand near the Duck Park parking lot offers some helpful guides to make your Island Park visit more enjoyable: Kid’s Guide to Island Park & the Alpena Wildlife Sanctuary offers a nature bingo game and other fun activities, Birds of Island Park is a guide to the seasonal visitors to the park’s trees and waterways (herons, swans, bald eagles, ducks, and more), and Island Park – A Forest Sampler highlights the park’s trees (white pine, aspen, red oak, jack pine, and more).